Catalina, third largest of the Channel Islands, feels like a world away. Twenty-two miles west into the Pacific from Los Angeles, the island combines natural beauty with a wide range of amenities and activities. With over fifty miles of shoreline, secluded coves and dramatic views, this destination has earned a reputation as "the island of romance." Fittingly, Avalon, Catalina's mile-square port city, is named for an island paradise in the King Arthur legend. Catalina's most famous landmark, the 1929 Art Deco Casino, dominates the waterfront. Rows of shops, restaurants and hotels stretch along Crescent Avenue and up into narrow streets dotted with bougainvillea-framed bungalows. Most of the town's attractions are within comfortable walking distance from the pier - snorkeling, kayaking, dining and shopping. The good news is that Catalina's charms should be enjoyed for years to come. The Santa Catalina Island Conservancy, a non-profit organization, owns and manages over 80% of the 76-square-mile island, a gift from the family of chewing gum magnate William Wrigley Jr. The Conservancy's holdings include Catalina's rugged interior and most of the coastline. Its goal is to restore and preserve the island's natural state. Catalina is a relaxed, friendly island with a Mediterranean feel, easy to explore on foot or by golf cart. Its rich marine life and clear calm waters make it a popular destination for water sports, from fishing and wake boarding to snorkeling and kayaking. 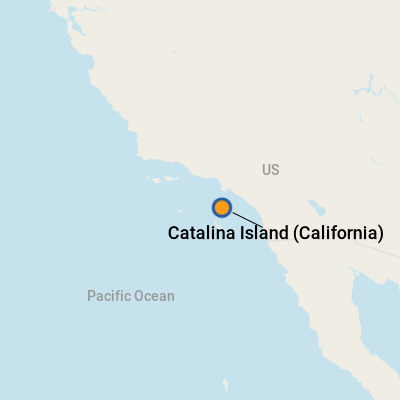 Catalina's port is too small for cruise ships. Instead, ships anchor outside the harbor and tender passengers to Green Pleasure Pier in the center of downtown Avalon. Green Pleasure Pier is a hub of activity. It's home to the Visitors Bureau, as well as rentals for motorboats, wave runners and fishing equipment. Glass bottom boat tours and semi-submersible tours launch from here. For years, the pier has been Avalon's official weigh station for sport fishermen, including Zane Grey, Cecil B. DeMille and Charlie Chaplin. Nearby Crescent Avenue is a pleasant place to window shop and enjoy an ice cream cone. Insider's Tip: On weekdays, tourists easily mingle with the island's 3,800 year-round residents. But on weekends and during the summer, it can be tough to find a place to lay your beach towel. To escape the crowds, bring your mask and snorkel on a short walk from the boat dock to the preserve at Lover's Cove. With no fishing or boat anchorage allowed, the Cove is rich in marine life. Or visit Little Harbor on the southwest shore, reached by Catalina Safari Shuttle Bus. Rugged waves crash on two beautiful sandy beaches at this secluded cove. Cars are limited on Catalina (there's a 8-10 year waiting list to own a car on the island). Most folks walk or rent golf carts and bicycles, the preferred modes of transportation. Even the sheriff drives a golf cart fitted with a siren and special high-speed gears (about $30/hour for carts for those 25 and older with a driver's license; $10/hour for bikes). The U.S. dollar is the official currency and ATMs are plentiful. Seafood: Along with a sushi bar, Flip's Saltwater Bar & Grill features live music (128 Catalina Avenue). On the deck at Armstrong's Fish Market, enjoy lunch favorites like fresh swordfish and mahi-mahi (306 Crescent). For fish and chips or seafood cocktail, stop by Avalon Seafood, known locally as Rosie's (end of Green Pleasure Pier, spring to fall). Italian: Cafe Prego offers plentiful portions of homemade pasta and fresh seafood, an extensive list of California and Italian wines, and a harbor view (603 Crescent Avenue). Ristorante Villa Portofino serves similar selections (101 Crescent). Desserts: Satisfy your sweet tooth with saltwater taffy and caramel apples at Lloyds of Avalon Confectionery (315 Crescent). Nearby is a new Cold Stone Creamery (118 Sumner Street). Buffalo Milk: A frothy blend of vodka, Kahlua, fresh banana and coconut milk served at Armstrong's Fish Market (the drink is named in honor of a herd of some 300 buffalo, descendants of animals brought here as movie extras in 1925, which still roam Catalina's interior).